A fine copy with an original great big red ink cartoon drawing of Gordon Butcher on the half title page, and signed by Ralph Steadman. The true story of a Suffolk ploughman, Gordon Butcher, who uncovered the greatest treasure ever found in the British Isles. It was Roman silver of unparalleled beauty and value and, not appreciating what he had discovered, Butcher was savagely cheated out of the fortune that should have been his. 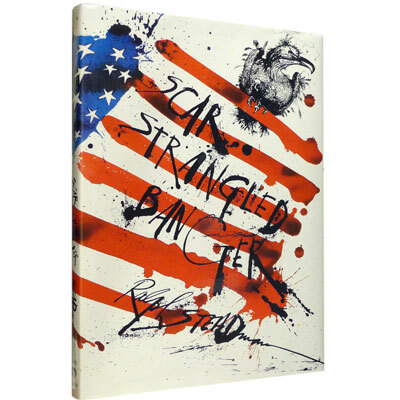 Scar Strangled Banger is one of two books (the other one being America) giving Steadman's view of America in retrospect-sharply satirizing all aspects of 1970’s and 1980’s life in American society, peppered with his sharp, powerful and incredible full-page and double-spread, colour and black & white drawings.